Gahanna-Jefferson Education Foundation is a proud sponsor of the GJPS Middle School Robotics Competition Team. 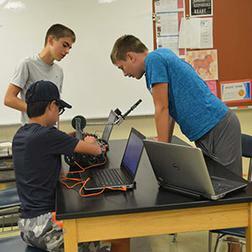 The Gahanna-Jefferson Education Foundation was created to "Promote Excellence" throughout our school district by funding innovative projects that are beyond traditional school district expenditures. Through a competitive grant procedure, The Foundation has been able to inspire cutting-edge programs in many areas. GJEF also supports many other initiatives including several scholarships, donor designated projects and the annual funding of a major expenditure through Fund A Need. Our sponsorship of several programs continues to grow, as The Foundation is able to use funds from various donors to support and impact students across the district. students of Gahanna-Jefferson Public Schools. As you can see, there is much to celebrate! WHAT WE ACCOMPLISHED IN 2017-2018!